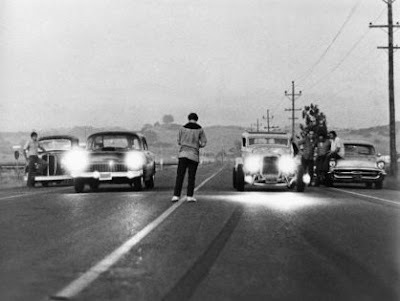 My daughters and I saw George Lucas at Border's this weekend, and I realized that I should probably add American Graffiti to the California Culture course. Before we get to it, we'll take on Didion's The White Album, Chinatown, and Dirty Harry, all pretty downbeat, and that movie's nostalgia--a kind of backward-looking utopia--was very welcome at the time of its release. It projected a simpler, happier time (pre-Kennedy assassination, Vietnam, Watergate, etc.) in the Central Valley, which we haven't paid much attention to since watching The Grapes of Wrath. The American Political Science Association gave Mark Danner, who teaches journalism at UC Berkeley, the Carey McWilliams Award for 2006. The award honors excellence in political writing. Steve Weinberg, who reviewed American Prophet for the San Francisco Chronicle, also published a review in The IRE Journal, which is devoted to investigative reporting and editing. It's a positive review, "splendid" being the operative adjective. I saw Joe Conason at Book Passage in Corte Madera yesterday. He has a new book out called It Can Happen Here: Authoritarian Peril in the Age of Bush, which builds on the uncanny resemblance between contemporary American politics and the bestselling Sinclair Lewis novel, It Can't Happen Here (1935). Joe is a real pro--great control over the facts, a talent for selection and emphasis, and a trenchant style. I'm not alone in my admiration. He's a New York Times bestselling author, director of investigative reporting at the Nation Institute, a columnist at Salon and the New York Observer, and a PoliPointPress author and advisor. Did I mention his great pipes? Perfect for radio and public speaking. This is all very well, fanatical readers of this blog will say, but where's the Carey McWilliams connection? Ah, here we go again. Have you forgotten that McWilliams wrote a pamphlet in 1935 called It Can Happen Here: Active Anti-Semitism in Los Angeles? Also, he ran one of Joe's first pieces back in the day. Now stop doubting me and go buy Joe's new book and The Raw Deal. I'm adding a link to Joe's blog--highly recommended. "The dirty war may not be lost by the United States, but neither will it be won. At the expense of mounting American casualties, it will drag on." "Despite our arsenal of weapons we do not have the power to 'win' this war." These comments, offered in 1961 and 1963 respectively, refer to Vietnam. In September 1963, the magazine observed, "The odds are that the Communists will eventually win in South Vietnam, their patience is more durable than America's enthusiasm for an expensive, futile war." If we switched out a couple of proper nouns in this sentence, would it not apply to Iraq today? I have a very crappy cable package. In some parts of the country, it's called "lifeline cable," and the cable company won't tell you about it unless you ask. Which means I watch a lot of C-SPAN. This morning, while my coffee was brewing, I tuned in to see Katrina vanden Heuvel, editor and publisher of The Nation, introduce author, photographer, and labor reporter David Bacon, who happens to live in Berkeley. In the middle of her introduction, Katrina suddenly launched into a fairly detailed account of Carey McWilliams's early career, including his labor writing and appointment to the California Division of Immigration and Housing. I almost did a spit-take with my coffee. I think it's the first time I've ever heard Carey's name uttered on television. Many of Carey's fans back east are only vaguely aware of his pre-Nation accomplishments, so I'm glad to see that Katrina is acknowledging them publicly. He passed away this week, too. He was the Stanford scholar who told Carey McWilliams in 1960 that the CIA was training a guerrilla force in Guatemala to invade Cuba. (The story had appeared in La Hora at the time.) McWilliams wrote an editorial for The Nation calling for more reporting on the matter. The New York Times confirmed the existence of the base, but Kennedy went ahead with the Bay of Pigs invasion anyway. Afterwards, Kennedy blamed the Times (not La Hora or The Nation) for spilling the beans on the invasion. He then admitted that more reporting by the Times might have prevented a colossal mistake. Arthur Schlesinger Jr. died yesterday. He graciously answered my questions about Carey McWilliams, with whom he had his differences over the years. At one point in the 1950s, for example, he described McWilliams as a Typhoid Mary of the left--meaning McWilliams carried the disease of Communism even though he wasn't stricken by it. McWilliams replied that Schlesinger spoke the language of McCarthyism with a Harvard accent--a barb Schlesinger remembered verbatim over 50 years later. Schlesinger was McWilliams's toughest critic, if not his most formidable adversary. But even he agreed that McWilliams--and The Nation under his guidance--produced a great deal of first-rate work. I'm grateful for Arthur Schlesinger Jr.'s cooperation on my book--and for his own staggering body of work.